Today, I would like to tell you about yet another great queen of Africa, Queen Amina of Zazzau. Just like Amanishakheto of Nubia, Nzingha of Angola, or Ranavalona I of Madagascar, Amina was a strong queen who loved her people, and totally marked her kingdom forever. Queen Amina of Zazzau was born around 1533 in the province of Zazzau, in modern-day Nigeria. Zazzau refers to the Zaria emirate which is a traditional state with headquarters in the city of Zaria in Kaduna state in Nigeria. Zazzau was one of the seven Hausa city-states which dominated the subsaharan trade after the collapse of the Songhai Empire at the end of the 16th century. Its wealth was due to the commerce of leather, textile, horses, salt, kola, cloth, and metals imported from the East. As a toddler, Amina was already attending state business on her grandfather, the king’s laps. At the age of 16, Amina was seen as a potential contender to her mother’s throne (Magajiya), the queen Bakwa of Turunku. Amina started to learn the responsibilities of a queen from her mother: taking part in daily assemblies with high dignitaries of the kingdom. Even though her mother’s reign had been one of peace and prosperity, Amina chose to learn military skills from the warriors. 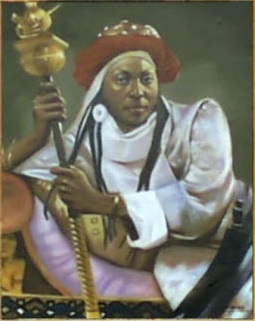 Queen Bakwa died around 1566, and the Zazzau kingdom was governed by her youngest brother Karama. During the reign of her brother, Amina emerged as principal warrior of the kingdom’s cavalry. Her military successes brought her wealth and power. 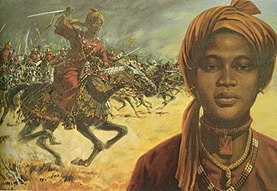 When her brother died after ten years of reign, Amina was crowned queen of Zazzau in 1576. During her reign, which lasted 34 years, she expanded her kingdom’s boundaries down to the Atlantic coast, she founded several cities, and personally led an army of 20,000 soldiers to numerous battles. However, her focus was not on annexation of neighboring lands, but on forcing local rulers to accept vassal status and allow Hausa traders safe passage. During her reign, she commanded the construction of a defensive mural around each military camp that she established. Later, those camps evolved into prosperous cities within those walls, and some can still be seen today in northern Nigeria. Those cities are known as walls ‘ganuwar of Amina’ or ‘Amina’s walls‘. It is believed that Amina died in the town of Altagara in 1610. Today, Amina is remembered in Nigeria as ‘Amina, rana de Yar Bakwa ta San’ (Amina, daughter of Nikatau, woman as capable as a man). The introduction of kola nuts into the region is often attributed to Amina. Amina is celebrated across the Hausaland as a great warrior queen who was born to rule, and led thousands of soldiers to war. To learn more, check out Black history heroes, History and Women, as well as the book African Princess which dedicates a chapter to this great queen. Amina’s achievement was the closest that any ruler had come in bringing the region now known as Nigeria under a single authority. Enjoy the video below of great African queens including Amina. Reblogged this on Bee Natural. Thanks for citing this article. I loved your images of Queen Amina. Great queen indeed! Thanks for commenting engr mg lawan bomai. sweet! I am so glad it is being taught in schools. where are your sources? Like where did you find this information? A lot of it can be found in the book ‘African princess’ (which include lots of references), a book I cited above, and others as well. In the early 1500s. Her reign is generally placed in the mid 1500s to early 1600s.